I really do believe it's all about love. the hymnal of my heart. Share with the group five favorite hymns or praise songs or songs that bring you close to the Spirit (that’s a pretty wide net!) and why they are special to you. 1. Come Thou Fount of Every Blessing – this hymn always makes me all verklempt. I LOVE the words, love the bit about the Ebenezer, referencing an obscure if important passage from Samuel, love the image of binding my prone-to-wander heart. Here is a link to a nice if a bit schmaltzy choral arrangement. 2. Lord Whose Love in Humble Service – I used this at my ordination to gather clergy for the laying on of hands. More great words, social justice theme, says things a middle-class congregation needs to be challenged by. Here is a congregational version, not great balance, but with some extra instruments and pleasant voices. 3. Listen! 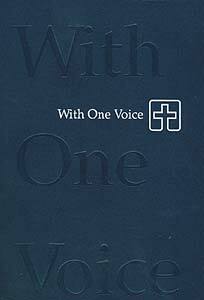 God Is Calling – I learned this through With One Voice, the hymnal pictured above. It was an attempt by the ELCA to bring together some favorites missed in the LBW, along with lots of songs from different countries and cultures. Here’s a lovely children’s choir doing a good version of this call-and-response song. 4. Lift Every Voice and Sing – When I lived in the Detroit area and had season tickets to the Detroit Symphony Orchestra, every February they would do a series of concerts uplifting African American contributions to music. Often the audience would be invited to sing along to this song setting of James Weldon Johnson’s poem, known as the Black National Anthem. People would stand. It was a good educational moment for this suburban white girl. 5. Now the Green Blade Rises – I always say I’m more of an Easter person than Christmas, though sitting here I can think of many favorite Christmas songs. I love this Easter hymn because it’s in a minor key and has a couple of weird jumps, which is good theology embodied. I love music! This was fun! Blessings to you all. Wonderful!!! I love these, some favorites and some new ones to me, too.